After a few days of relaxation in Sihanoukville (a sleepy Cambodian beach town), it was off to Vietnam. The first stop was Chau Doc, which is a small city in the Mekong Delta. It was while in Chau Doc that I had the pleasure of experiencing a motorcycle ride to the top of Muay Sam hill to view the sunset. I was a little nervous about the motorcycle at first—not just because you never know if you can trust your driver, but also because the streets are swarming with motorcycles here and it doesn’t always appear safe. Anyhow, the ride turned out to be incredibly pleasant and even relaxing. It was lovely to ride through town and along the tendrils of the Mekong with the wind rushing past and nothing between you and the great outdoors. Of course, this means nothing to protect you from either the dust or the fetid smells of the city, but also nothing to obscure your vision of the fertile land, the fish farms, and the charming stilt houses that precariously line the waterways. 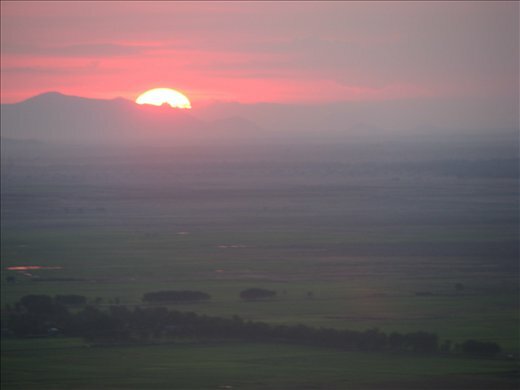 Once at the top of the Muay Sam, the sun slowly made its way toward the earth, bursting into brilliant shades of red as it collided with the horizon. After Chau Doc came a long, eight-hour bus ride to Ho Chi Minh City, which is still referred as Saigon by those who live here. Saigon is Vietnam’s largest city with over 7 million inhabitants. Despite its size, however, the downtown area has an accessible feel to it and as long as you can tolerate the heat, you can easily walk to your destinations (or hire a motorbike or cyclo…there are no auto-rickshaws here). Saigon marks the last third of my trip and is the city where I will volunteer at a private orphanage run by a Buddhist association. In fact, as I write, I am at the volunteer house, which is in a bustling urban neighborhood away from all of Saigon’s tourist attractions. I actually prefer this, for it provides a peek into “real” Vietnamese life. The house itself is tucked away in a narrow alleyway that was so hidden, I walked right by it twice. When I finally asked directions and was directed to a 4 foot-wide opening tucked between two bridal shops, I thought surely it was a joke. But when I walked into the dingy alleyway, it turned a corner and opened into a maze-like area full of homes built in the typical narrow, but several-stories-high style that you see a lot here. As I walked by the homes, I was surprised to see all of the front doors wide open to welcome in any stray breeze. It seems incredibly trusting for such a huge city, but I’m told it’s quite safe. It’s also kind of interesting to peek into each house to see what it’s like inside. I would normally feel a bit voyeuristic about this, except the locals seem to do it as much as I do. Of course, that might be because they’re curious about the inhabitants of this particular house, which appears to be the only one in this part of the maze that contains foreigners. Tomorrow will be my first day at the orphanage. I look forward to meeting the kids.